and to all the new subscribers from last week, welcome. 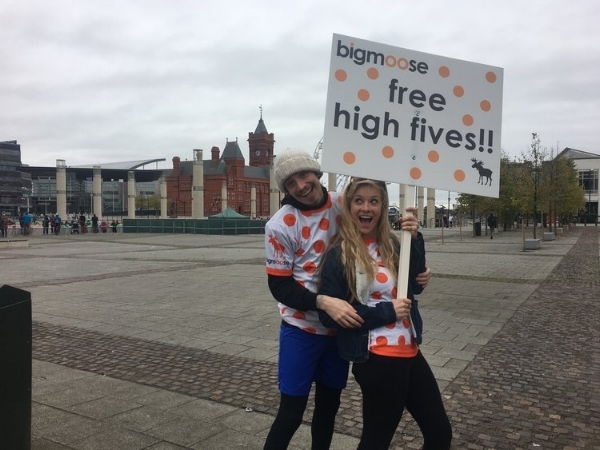 the cardiff half marathon provided bigmoose with a place to shout about what we do, and with our brightly emblazoned shirts, and placards with motivational, and hopefully a couple of funny sayings, engaged us with the 25000 strong crowd, and the response has been brilliant. we have had loads of e-mails and messages direct and on social media, with some awesome comments about our presence at the race, and i'll talk about the race in a bit more detail later, but for now, thanks for subscribing, i can't promise anything except hopefully stuff that might just inspire you to do some cool shizzle in your life, that maybe you wouldn't have done before you pressed 'subscribe' and if if that is how it pans out, then that's a good thing i reckon, what say you? i want to tell a couple of stories, which are all linked really, just to show the power of small actions. two people have been pretty pivotal in my life, resulting in you and i having this relationship, and a third whose one action has proved to be amazing. 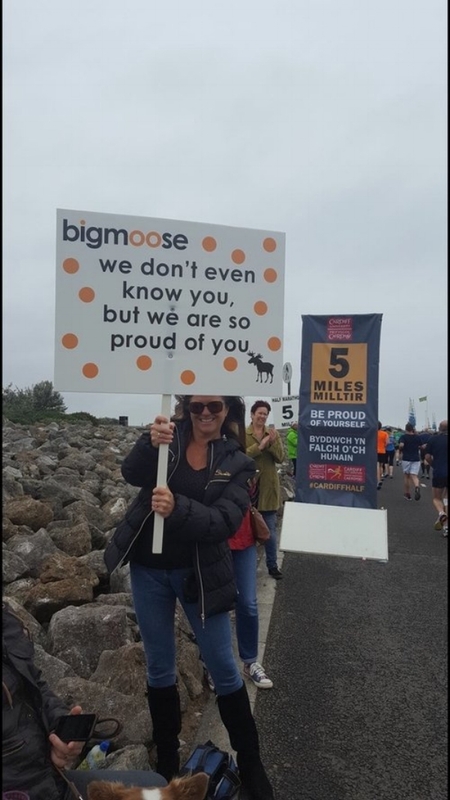 first, georgina jones, my pal who ran the cardiff half on sunday and supports everything bigmoose does, and is solely responsible for me doing public speaking, which is now a big part of my life. my schoolteacher, mr fuller, who was my form master and english teacher, who was pretty much a hippy, very tall, about 6'4" with really long hair and a beard, resembling catweazle a tv character from the 80's. mr fuller taught me to enjoy the english language, and unbeknownst to me at the time was influencing my life in a rough part of finsbury park, and encouraging me to read and write as much as i could, and here i am writing this blog for you, and currently writing two books, thanks mr fuller. i did try to hunt him down to say thank you, but failed miserably, but you never know, could you imagine having taught some snotty nosed kid back in the 70's, and he gets back in touch to say he holds you responsible for his current life, that would be pretty cool huh, i'll keep looking. so, mr fuller encourages me to speak and write and enjoy english, and george encourages me to speak in public about what i'm up to, and then the third person in this story assumes his role. i've spoken about john before, he's a northern dude who is an ex dj, supports preston north end football club, and having not really spoken to each other for some years when we shared an office space in cardiff, contacted me to ask me to compere an event he was putting on in cardiff. i go and compere the sharetalk event in cardiff, which john pays me to do to help pay for my everest trip, and at the same time i do a talk about bigmoose. peter higgins is a shareholder in sharetalk, and we meet and chat. i meet joão andrade who is the ceo of widecells plc who takes the microphone during the q & a and commits to help raise money for bigmoose. so the story is starting to weave itself together. 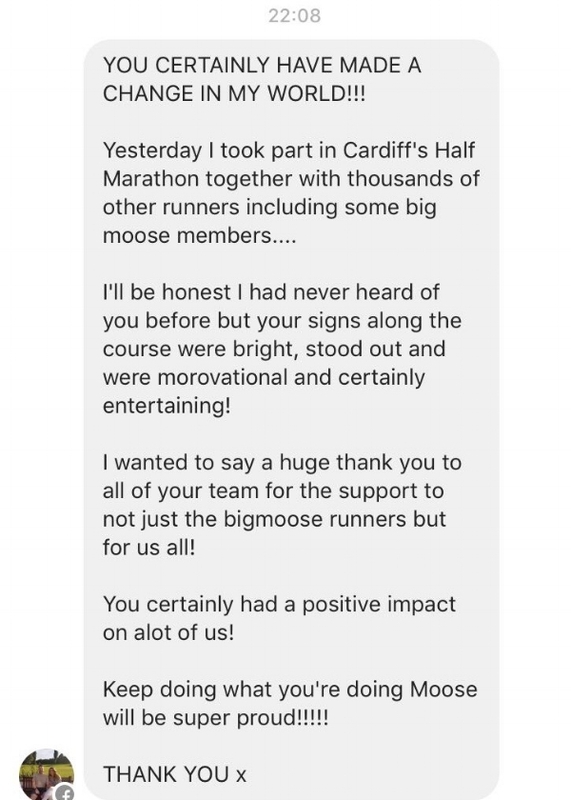 along the way we are arranging the cardiff bigmoose half marathon team, and recruiting as many people as you can shake a stick at. 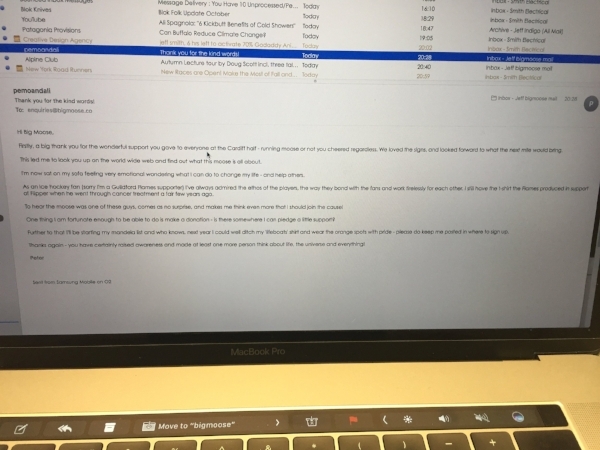 i go to widecells plc in manchester to do a talk about bigmoose, meet alan greenberg, ex head of apple education, who invites me to london to discuss his involvement with bigmoose. whilst with alan in london, he introduces me to two chaps graham livesey and glyn shier who work in the same space as alan, and who i told about bigmoose and the cardiff half. so october 1st in cardiff this happens. i meet joão at 07:30 outside our proposed site for our bigmoose coffee shop, with a camera man filming an interview about how he is commited to raising £50k for bigmoose, and is running the cardiff half with his wife vivian, who has never run a race in her life but really wants to be involved. 08:15 i meet tom holmes one of our runners, who was struggling with mental health issues, details of which i don't want to share, but was in a very dark place, and since joining our training runs, and signing up to the half has now stopped having counselling, as his counsellor has told him he is good to go. tom and i wander over for our 08:30 interview with the bbc where tom talks to camera, and doesn't stop beaming his massive 'tom' smile. 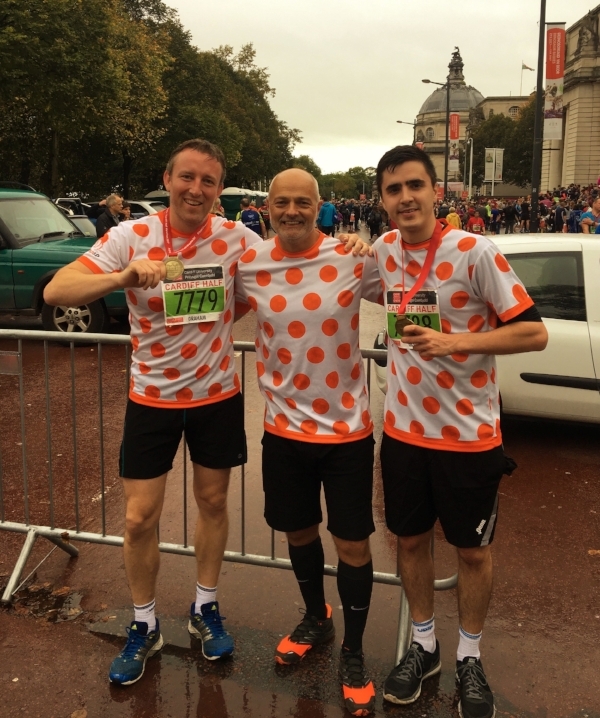 08:45 we have gone back to our bigmoose meeting point and i see graham and glyn, who i haven't seen since my brief meeting in london, looking fit and strong and resplendent in their bright, orange spotty bigmoose shirts. we have the obligatory team picture, and the whole team chants 'moose moose moose' in a very deep war cry like fashion, which would make my old mate chuckle i reckon. everybody except me (bad knees from the hill still) and chloe (recovering from her ultra) rock off to their positions at the start of the race, it felt a bit like when i dropped my first born off at school for that first morning, i have to admit. 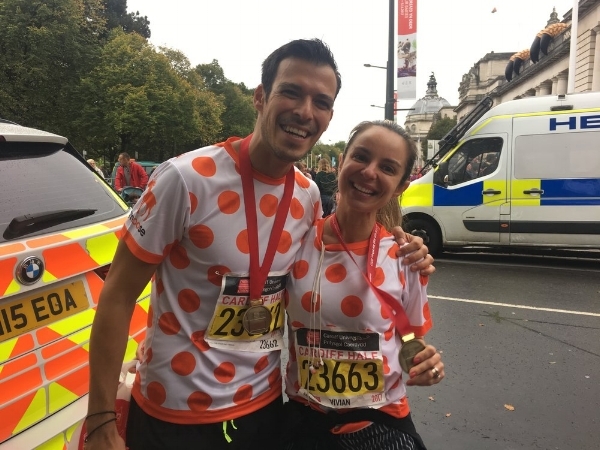 30 minutes in, my phone rings, and it's peter higgins, who has driven from leicester to accompany his wife sarah who is running for the first time, and he and their daughter evony will be cheering her on along the route, and they will meet us back at bigmoose basecamp after the race. so five people running from portugal, london and leicester, and raising over fifty grand for bigmoose, all because of john's intro, george and mr fullers encouragement, and yesterday a friend asked me if i like doing the public speaking and i replied without pausing, an emphatic "i love it", and i know why i love it, because it spreads the word, it allows me to encourage and recruit people to join us, and definitely allows me to leave the world better than when i found it, so yes i love talking, check out these smiles, what's not to love. graham, me and glyn, thanks guys. sarah and peter's lovely daughter evony, sporting her spotty bigmoose bow! and here is a link to the sweetest video of sarah you could ever wish to see. 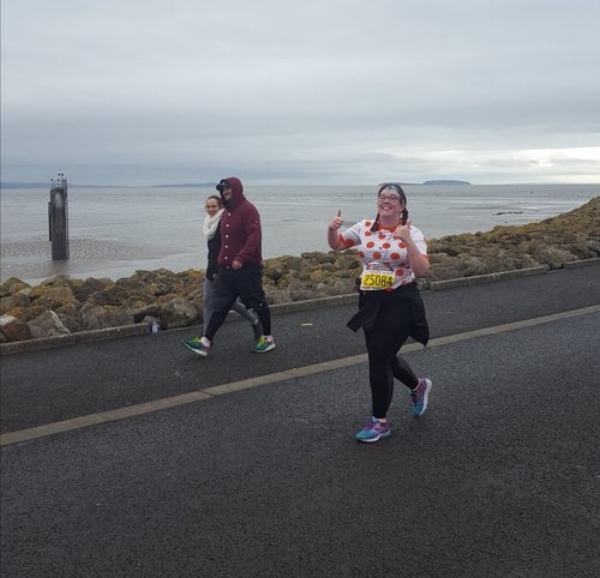 and then, to my personal fave, beth, who had never run a step before rocking up to one of our training runs, and then didn't stop training, and now is the proud owner of a cardiff half medal, quality!!! so, so proud of beth. as well as amazing runners, we also had 14 cheer stations along the route, with a mix of crazy dedicated friends, all offering energy, encouragement, high fives and snacks to the runners, thank you everyone who stood in the cold for hours offering support, your efforts were really well received, thank you. so we all had a spiffing time all in all, but what we didn't expect was the response from the general public, we have been inundated with lovely comments and thank you's from runners who saw the signs, our runners, and heard the cry of 'moose moose moose' all along the route, and whilst i haven't got time or room to share them all with you, here are just a couple. so the impact we made on the race was pretty great, so again thanks to everybody that got involved in any way, and if you didn't but fancy having a bash next year, we will be doing it all again, and have some ideas and plans afoot already, so drop us a line if you wanna be kept informed. now as well as the half, we have had loads going on, and it's been a pretty good week all in all, with mr x allowing me to go and collect all the furniture for the coffee shop on monday, a talk with a secret government department, which i have to stay shtum about happening tuesday, yes my bottle is going, and every digit available is crossed for some good news on the lease for bigmoose coffee co, please please please let us get it soon, you must be bored of hearing about us being 'nearly there'. so i have just had the blog police sound their siren, so i better let you crack on, but thanks for reading, thanks for supporting, and never forget small actions can have massive reactions, go gettem bigmoose gang!! we never spam you, as even just the word spam gross's us out, i'm actually gagging just typing it, no spam, ever, promise.